Once the decision was made to ground the Boeing 737 Max 8 airplane last week, somehow it made sense. Until then, mysteriously, we were somehow still awaiting more information as country after country suspended their use. Indeed, the United States was the last to declare emergency grounding. Did our FAA have some special knowledge here that other international agencies do not? Or was this lack of action the result of protectionist action for American business or political power? Was it the FAA or the president who delayed? And how, after all, is this looking out for the best safety interests of Americans? There have been hints, but no specific reporting I’ve seen on the question. So, I was attracted by the New York Times Op-Ed column by James E. Hall, former chairman of the National Transportation Safety Board, which looks into such accidents as we have seen with this aircraft, who lays the blame at regulatory changes. The decisions about the safety of these new-model planes are in the hands of Boeing itself. Thus, the decisions about the safety of these new-model planes—crashes of which have killed all 189 and 157 aboard two recent international flights under similar circumstances—apparently are in the hands of Boeing itself. 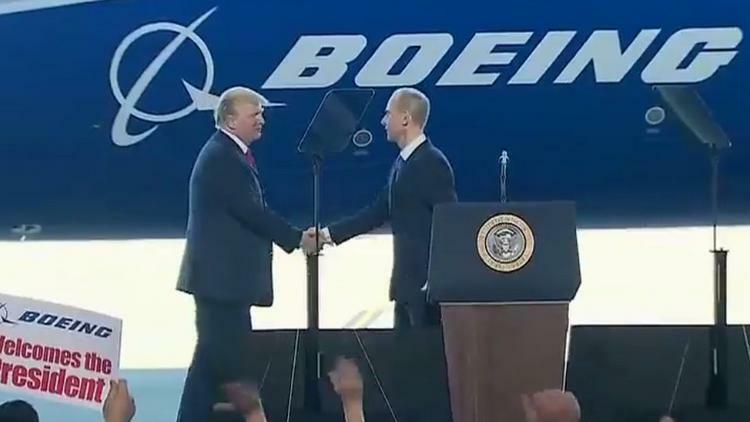 And yes, Boeing’s CEO, Dennis Muilenburg, is a personal friend of Donald Trump, owner of the Trump Special from Boeing, an air flight enthusiast, and frequent promoter in international talks. Muilenburg apparently told Trump that there was no reason yet to ground the plane—so we didn’t. Indeed, pilots who met with Boeing to complain about the plane’s software last fall say they were told that the manufacturer would upgrade computers by the end of 2018. Nothing happened, they said, including no additional training information. Former NTSB chair Hall noted that President Trump’s executive order on Wednesday afternoon to ground all Boeing 737 Max 8s was necessary but that it should have come from the FAA rather than the White House. As he outlined, before this policy was instituted, the FAA selected these airworthiness representatives, who may have worked for the manufacturer but were chosen and supervised by the agency. These experts were responsible for guiding the agency’s decisions about whether to ground an aircraft for safety concerns. Necessarily, grounding plans is rare. This Trump administration has declared its love and belief in deregulation, an insistence that problems meant to be addressed by the red tape of bureaucracy just would not exist if we did not make business spend time defending themselves. The more we learn about these Boeing Max plane accidents, the more that notion seems adrift. Most accidents today do not result from systematic aircraft flaws that would justify grounding an entire fleet. Hall recommended grounding an airliner model only once in my seven years as chairman of the National Transportation Safety Board, following a commuter airliner crash in Indiana. Since this new “regulatory” scheme took effect, Hall recounted, the aviation industry has introduced two new aircraft types, both of which have encountered serious problems. In 2013, Boeing’s 787 Dreamliner was grounded because of fires caused by lithium batteries. In that case, the agency quickly recertified the safety of the aircraft, even before the exact cause of the Dreamliner problems had been determined. And now, we have the troubled flight management systems of the 737 Max 8, which made its first commercial flight in May 2017. In this case, there have been two catastrophic accidents within five months of each other, involving a relatively new model of aircraft. Boeing itself acknowledges that it is developing a revision to its flight management system. In the end, Hall argues, grounding this aircraft was the right thing to do. It will allow regulators and Boeing’s engineers to determine what exactly caused this crash. But he warns, the problems of the 737’s latest model, the Max 8, show that those responsible for ensuring the safety of our skies have strayed from this successful path, and lives have been unnecessarily placed at risk. The FAA’s oversight of aircraft safety needs to be examined by Congress, which should act to make sure the agency names independent experts to determine the airworthiness of an aircraft. The president is quick to say he is acting first on behalf of the safety of the American people. I guess that is, unless it interferes with American business.